The Wandering Moose Cafe is a family operation run by Cumberland locals, Bill and Lisa Ransom along with their daughter Meghan. We also have two or three more local staff to round out our awesome team. Our goal is to offer quality products in a friendly, quick and efficient manner for people on the go or with time to just sit back and relax in a beautiful part of history. 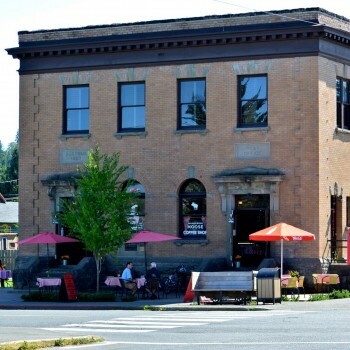 Located in the Historical Post Office (built in 1907) on the corner of Dunsmuir and Third Ave, our ambience is open space with an emphasis on being child friendly (designated children’s play area) and featuring a comfortable lounging area for curling up with a magazine, newspaper, book or just chatting with friends and family. We also have free internet access and a variety of board and card games available for your entertainment. The cafe also features a large outdoor patio for those nice sunny days.